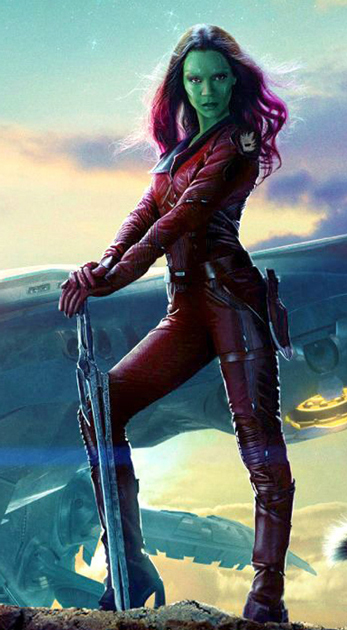 She's Fantastic: Guardians of the Galaxy - GAMORA! 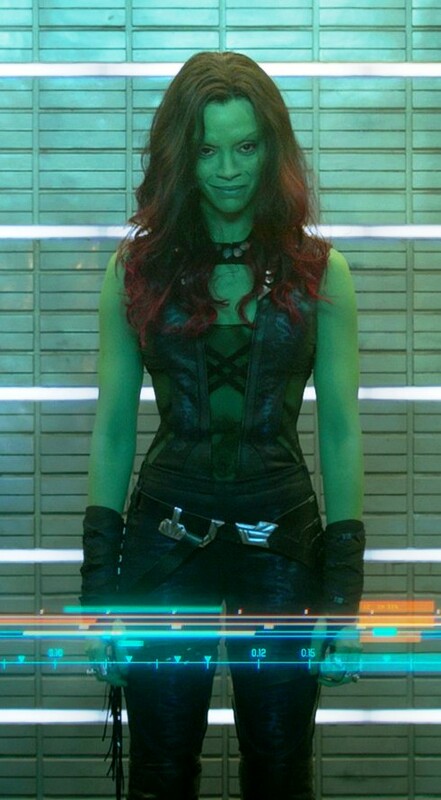 Guardians of the Galaxy - GAMORA! Very few movies in the past few years have created such intrigue for me as the upcoming Guardians of the Galaxy. When they first announced the movie a few years ago, I thought it would bomb. Then I started reading the new comic and I suddenly saw potential. But then I saw the first preview of the movie and it had a very unexpected tone - which I actually really enjoyed. The newest Marvel Legends: Infinite Series is a Guardians of the Galaxy themed assortment with a Groot Build-a-Figure. I love Groot. Tree-people thrill me. So of course when I found this wave in the store this afternoon I had to splurge and get the entire wave. While I'm a little bummed we didn't get Nebula as a second figure, I am surprisingly impressed with this Gamora figure. In the comics, Gamora is the daughter of Thanos (adopted) and has earned the title of the "deadliest woman in the galaxy." I guess we'll see if those details are the same in the movie. This figure turned out a lot better than the solicitation pics made her out to be. I felt her face look flat and uninteresting in those pics, but in person she looks pretty great. Let's check her out below! The character design in the movie doesn't look nearly as cool as her comic incarnations in my opinion. I think the biggest missing feature is the gold markings around her eyes. It's a shame they couldn't incorporate that into the makeup. The likeness to actress Zoe Saldana is pretty amazing. Much better than the Uhura and Neytiri figures we've seen. Considering how much this and the Scarlett Johansson Black Widow figure looked like their respective actors, I'm assuming Hasbro is utilizing facial scanning technology. Gamora comes with a "sword" accessory. It's made of a thin and flexible plastic and mine has a pretty severe curve (which I tried to hide in all these photos). While her overall articulation is great, I thought her knees were a little weird. They are double-jointed and the hinge is on a pretty awkward angle. I thought my figure had warped knees for a moment before I realized it was intentional. 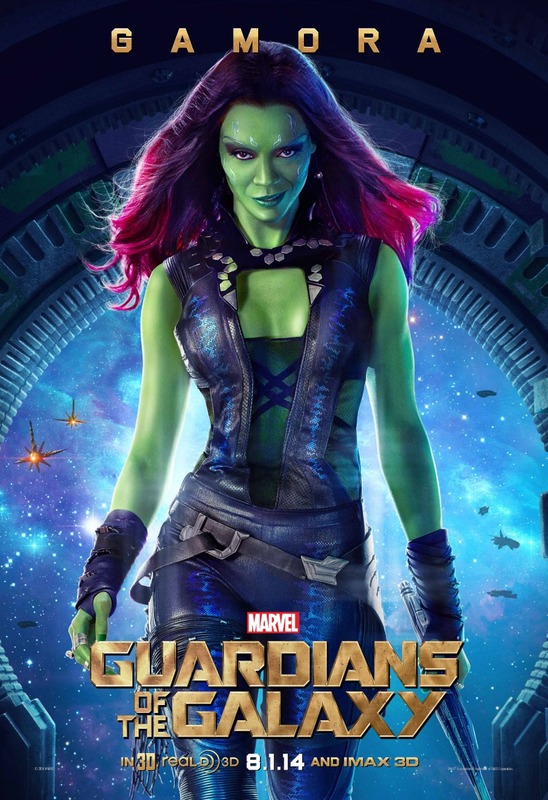 Here are some promotional images of Zoe Saldana as Gamora from the film. Here she is with the recent Black Widow figure. Here she is with the rest of her team from the movie. ...And with the addition of Iron Man and Nova from this wave. I agree for the most part. I only customize figures if I truly truly hate them, but I might make an exception with her and repaint the face. I bet I can coax a completely different look with just a little touchup.